The “old boys’ network” is traditionally an exclusive, if informal, group of old colleagues who lend each other mutual assistance and support and exchange favours in areas such as politics or business. The group usually grew up from a school or a college, and anyone outside of that group would not get the same favourable treatment. It meant that those blessed with public school or college education would stand a better chance of getting such “favours” than, say, anyone born into a so-called working class background. That’s as true today as it ever was, but … there is now a fundamental difference to the old boys’ network. Anyone can form one and anyone can join! Networking is very important these days – the route to success really is about having contacts – but there are many more ways of joining or even forming your own network than there used to be. 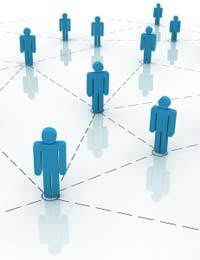 The online evolution of the Internet has brought us a stream of networking opportunities. From Ecademy to Twitter there are numerous ways of making contacts and keeping people informed of your activities. Entrepreneurs often suffer from a sense of isolation and online networking can help alleviate that particular problem. Ecademy is a primarily business example of an online networking group. It has the strapline “connecting business people”. Here you join up and search for people you know or people in the same line of business as you, or people who have nothing to do with you whatsoever! The idea is to build up a list of contacts, many of whom may seem to have no relevance when you first add them to your network. It costs to get the best services out of Ecademy. Another “professional networking” service is LinkedIn where you are encouraged to find old colleagues or classmates and “discover inside connections when you’re looking for a job or new business opportunity” – the epitome of the old boys’ network. The difference is that you can make connections with anyone – so long as they agree. Where business networking went, social networking soon followed. Indeed, Friends Reunited was probably the first example of a social networking site, preceding most of the business equivalents, and firmly rooted in the idea of re-connecting old classmates. However, Friends Reunited got overtaken when more dynamic networking sites like MySpace came into being – allowing people to upload photos and music, all for free, whereas Friends made a charge at that time. MySpace was overtaken by Facebook, which had an incredibly easy update facility and allowed people to say what they were doing right at the moment – their status. Other “friends” can comment back just as quickly. One of the latest incarnations is Twitter where you have 140 characters to give your status update. Here you “follow” people and you have “followers”, but it’s basically the same idea as having friends on other sites. The proliferation of these sites means that each one will copy the best ideas from the others, but try to present such ideas with their own unique slant. Inevitably, some will prove more successful than others and many will fall by the wayside. How Can Businesses Use These Sites? Such sites as those mentioned (and there are plenty of others too) give great opportunities for entrepreneurs to get their message “out there”. They all enable you to build a network of business clients and communicate with them quickly and easily (to a greater or lesser degree). Those (good examples are Facebook and Twitter) that allow you to send a message to a great many people are particularly good for giving you the chance to drive traffic to your website. Small and young businesses and entrepreneurs often operate on a low marketing budget, so free online networking is a real bonus. The secret is to keep building your contacts list. It is not always quality that matters, but quantity. Don’t limit yourself to people you know or people in your line of business – spread your net wide and you will often find some very good catches.